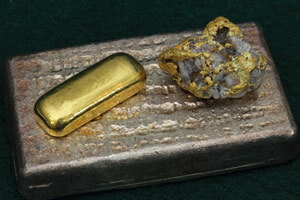 Precious metals futures retreated Wednesday, trimming a portion of their prior day’s strong gains, as investors booked some profits. Gold for December delivery shed $4.80, or 0.4%, to settle at $1,349.20 an ounce on the Comex division of the New York Mercantile Exchange. "Open interest increased with the price improvement, and that tells me some people are coming back into the market," Bloomberg News quoted George Gero, a managing director at RBC Wealth Management in New York. "Today, people are just profit-taking from the quick run-up," he added. Gold futures ranged from a low of $1,346.90 to a high of $1,357.60. They surged 2.1% in the previous session, closing at their highest level since Aug. 18. Elsewhere, silver for December delivery declined 29 cents, or 1.4%, to settle at $19.848 an ounce. Silver futures traded between $19.81 and $20.24. They jumped 4% on Tuesday and ended at their best price since Aug. 10. October platinum fell $9.90, or 0.9%, to $1,092.80 an ounce, ranging from $1,090.50 to $1,110.50. Palladium for December delivery dropped $12.30, or 1.8%, to $688.35 an ounce, trading between $687.50 and $712. Gold gained $11.10, or 0.8%, to $1,348.35 an ounce. Silver added 32 cents, or 1.6%, to $19.92 an ounce. U.S. Mint bullion sales advances included 4,250 ounces in gold coins and 172,500 ounces in silver coins. Below is a sales breakdown of U.S. Mint bullion products with columns listing the number of bullion coins sold during varying periods Products with an asterisk (*) are no longer available.